"Everytime we come here, we feel like family. You won’t be disappointed." "A great refuge & sanctuary, full of fascinating American history." some of the most gorgeous views. felt totally re-energized; Everyone can benefit from this place." The large hot pool will be closed for maintenance from May 6th — May 10th and will reopen on the 11th. 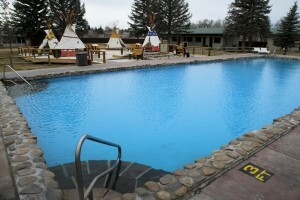 The small hot pools will remain open during this time. Soak away your cares in the healing waters of Saratoga’s natural mineral hot springs teepee-covered pools and 70’ hot pool. Indulge in pampering massage, body and energy treatments designed to sooth and relax the mind, body and spirit. Quench your thirst with cold craft beers on tap & feast on everything from wings to homemade pizzas in this classic wild-west style pub. Enjoy freshly brewed craft beers on tap, in growlers or cans to go. SMB beers can be found on tap in many other Wyoming establishments. Keep your eye on the ball and test your skills on this scenic 9-hole course that straddles the beautiful North Platte River. Say “I do” in a unique western setting where family and friends can enjoy a special event that will be remembered forever. The Romantic Getaway includes a couple’s massage for 2 in the Healing Waters Spa couples suite along with champagne and chocolates delivered to your room. Join the Club! Enjoy exclusive discounts and club-member-only activities (to be announced in the Smoke Signals newsletter). The Saratoga Hot Springs Resort is ideal for romantic getaways, family gatherings, western weddings, corporate meetings and events. Soothe your soul in mineral hot springs pools, get pampered in the Healing Waters Spa, celebrate good friends and good times in the Snowy Mountain Pub and Biergarten, have a ball at the Saratoga Public Golf Course, and blaze new trails in the nearby mountains. Visit us to enjoy all Saratoga Hot Springs Resort has to offer.